Supplemental structural support systems should only be installed based on a thorough inspection and evaluation of tree structure by our certified Arborists. Materials and techniques must comply with published industry standards (American National Standards Institute A-300 Standards). 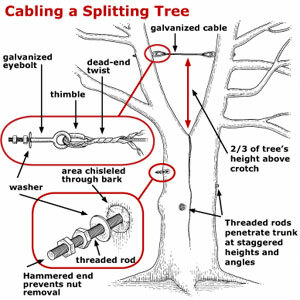 If trees have lightning protection systems, the conductor must be attached to any support cables in the crown. Homeowners with supplemental structural support systems should contact Advance Tree Service, Inc. to inspect the system each year.